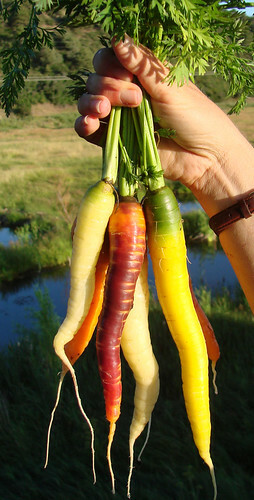 This was actually three different carrot varieties, including one called “rainbow”. Why seed catalogs don’t just put together a mixed color carrot packet like they do with lettuce is beyond me. My current favorite carrot (at least for Colorado) was Napa, which had great taste, wasn’t too long, and grew well (no splitting) in clay soils. I am a connoisseur of seed catalogs. I spend hours pouring over them, comparing prices and circling what’s on my “wish list”. 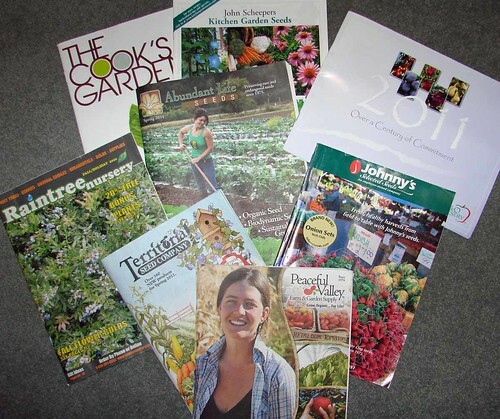 Ever wonder why anyone would order from a catalog and pay shipping when you can just go down to your local hardware store and pick up a packet of seeds? One word. Selection. You just can’t beat a catalog with 18 different varieties of carrots, complete with information on type, length, season, soil preference and color, along with a tantalizing picture. Secondly, germination. Often the seeds in a hardware store have been sitting under who knows what kind of conditions for some time. Gardeners generally report lower germination rates for packets purchased in stores. When you have a short growing season with no time to replant, finding out that only 1 out of 7 cucumber plants came up can devastate your pickling plans for the year. Looking for something really specific? Mother Earth News has a seed and plant look up feature, where you type in the name, and it will tell you who has it. Pretty cool. Growing tomatoes at 7,000 ft in Colorado was hard. Really hard. So having access to seed catalogs that carried short season determinate varieties was critical to success. The common Early Girl and Better Boy available at the local nursery just would not perform. The variety here is likely Oregon Spring. So, just for fun, let’s do a cost comparison of several of my favorite seed catalogs, picking a common beet, Early Wonder Tall Top, and Black Seeded Simpson lettuce, that most everyone carries. Note that there are 28.35 grams in one ounce. Territorial Seed: Beet; $2.40/sampler packet, 5 grams seed. Lettuce (Simpson Elite – a similar variety); $2.95/sampler, 1 gram. Johnny’s Selected Seeds: Beet; $2.95/packet, 5 grams seed. Lettuce; $2.15/packet, 1 gram seed. Peaceful Valley Farm & Garden Supply: Beet; $2.49/pack. 250 seeds per pack. ORGANIC. Lettuce; $2.49/pack, 1,000 seeds. ORGANIC. Fedco Seeds: Beet; .70/pack. 1/8 oz (.125 oz) or $1.00 for the same in ORGANIC. Lettuce; $.90/pack, 2 grams for ORGANIC. Fedco Seeds (which is a seed co-op out of Maine that somehow I just learned about a few weeks ago) wins out on the price wars, hands down. Even though their seed packet is sometimes a bit smaller, they still come out ahead. They pledge to not knowingly sell genetically modified seed, and they carry a lot of organic seed. For orders of seed over $30, the shipping is free. Otherwise, it’s a max of $5, a huge break compared to other catalogs. And their Garden Watch rating? Excellent. How could I have not known about this company before now? I hear they sell out early, so if you like how this sounds as much as I do, order soon. I’ve ordered from Territorial for years. For a long time, they seemed to be the only company that had any sense of how to organize a catalog in a logical way. I also appreciated that they were located in the west, in the Willamette Valley in Oregon. But with the exception of their onion plants (not sets, plants. I have not had good luck with sets, which all seem to be double bulbs and so not store well for me), they have lost me as a customer. They are one of the most expensive seed companies out there and their shipping costs are quite high. Johnny’s is similar to Territorial, in terms of quality, which is excellent. And they sometimes have hard to find varieties. But their prices are not competitive with Peaceful Valley or Fedco. 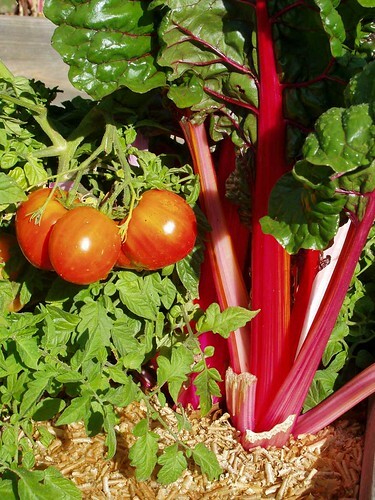 Peaceful Valley Farm & Garden is a GREAT place to go for organic pesticides, fertilizers, cover crops and general advice on how to grow organic. And their house brand of seed is quite reasonable at $2.49 per pack for organic seed. I was planning on ordering most of my seed from them this year before I discovered Fedco. Note they will often throw in a free seed pack of your choice with your order. So, it pays to sharpen your pencil, read, compare, dream, and dig the change out of the couch cushions. Miles Away Farm Blog © 2011, where we’re miles away from putting anything in the ground (think April 1st) but we’re almost ready to order.